Here's a look at our favorite new Disney fashionables hitting the shelves this fall in time for the Holidays. I personally can't wait to start shopping after getting a close up view of these items. Everything in these new Minnie and Pooh accessories collections is adorable. I especially love the back of the Pooh tote. Check out the adorable trio of Piglet, Tigger and Eeyore. The Minnie ears purse and the Minnie hoodie with ears is a must buy for all the girls on my list. 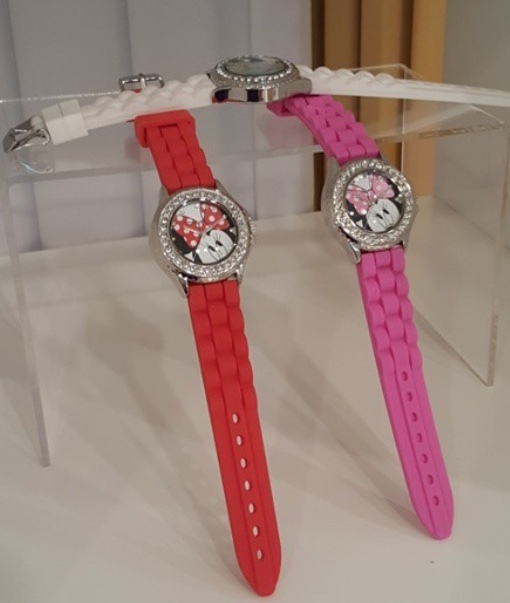 Run, don't walk to JC Penney for these colorful Minnie watches. They are $20 and come in three colors red, pink and white. Holiday pajamas for the entire family! Whether you prefer Classic Disney or favor the Force you will be dressed in style waiting for Santa to visit! These Tsum Tsums are actually stackable lip balms! Available at Target for $3.99 each, they are going to fly off the shelves! For the Love of Frozen by e.l.f.